​In Khmer, Tonlé Sap means “large river.” In fact, however, it is not a river at all, though it does have the mighty Mekong as its chief tributary. Tonlé Sap is a huge, freshwater lake, the largest in Southeast Asia. During the monsoons, when it reaches peak capacity, it is around one-hundred-sixty miles long and sixty miles wide. In 1997 it was designated a United Nations biosphere reserve. I can’t say that Tonlé Sap is beautiful in terms of landscape. The surrounding area is a delta, more or less flat. Hence, a cruise along its banks will not provide striking views of towering cliffs or dense jungle. 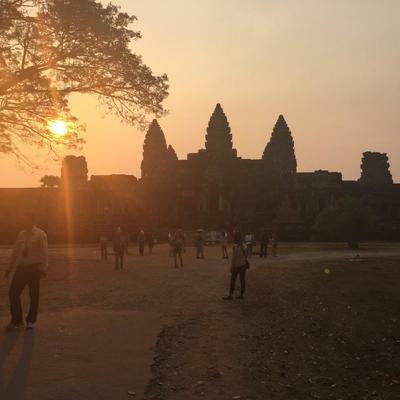 And yet, of all the places I visited in Cambodia, it is the one I most remember. Tonlé Sap is only about a thirty-minute drive from Siem Reap, the most famous, and by far the most “touristy” of Cambodian towns. It is a jumble of hotels, both large and small, some modest, some luxurious. There are multitudes of restaurants and shops, all as bustling as the street traffic. The younger crowd congregates on Pub Street, where beer or cocktails cost a dollar, save during Happy Hour, when they are even less. There is little that is distinctly Cambodian about the food in this part of Siem Reap, but nearby, you can try a small fried snake gracefully woven onto a wooden spit, or fried grass-hoppers that taste like popcorn. I am not one for noisy night life, so when in Siem Reap, I prefer the City River Hotel, on Achasva Street, near the riverbank. It has lovely rooms for as low as forty dollars a night, and from its rooftop pool, you can look out over a city that suddenly appears quite tranquil. 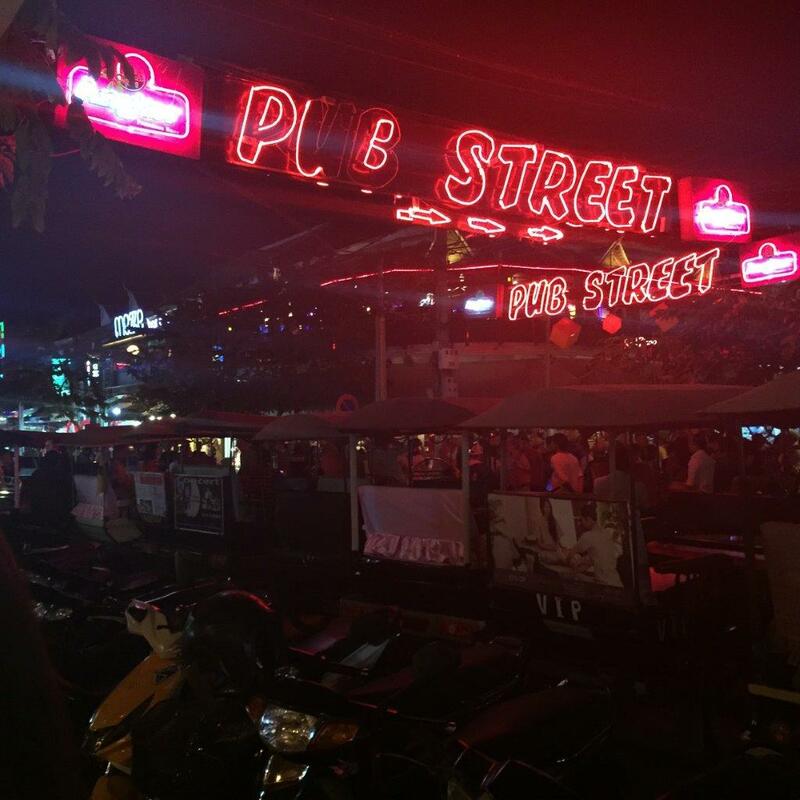 Even so, the hotel is very much in the town, an easy walk to Pub Street or the Night Market. The great temples of Angkor Wat lie just beyond the town, and once there, you can move in dreamy awe from one mesmerizing temple to the next. The visions here are magical, and at times, surreal. I remember looking up to see an enormous beehive hanging from a high jungle limb. The sun’s rays flowed through it and turned it into a beaming web of gold. Given such striking natural creations, it is no surprise that parts of Raiders of the Lost Ark were filmed here. ​Tonlé Sap offers a great contrast to both the sports bar atmosphere of Pub Street and the ghostly splendor of Angkor Wat. It is in the middle of a huge flood plain, and on its very tranquil waters, you can take a long, much-needed breath. From Siem Reap town, the journey to Tonlé Sap is only about half-an-hour by car. It is slightly longer by tuk-tuk, but while in Cambodia, I much preferred the latter means of conveyance. A tuk-tuk is basically a motorized rickshaw. Riding in one, you remain at ground level, seeing and smelling and absorbing far more than you would in a taxi or a bus. Once at the lake, you can choose how you want to explore it. There are small boats available if you want to go alone or with a few companions. But there are also spacious cruisers that provide both half-day and full-day tours. These stop at various pre-determined spots along the lake, a floating animal preserve, for example, and, of course, a floating gift-shop. Both forms of transportation are extremely inexpensive, since Cambodia is still one of the world’s best “bang-for-your-buck” vacation spots. If you prefer luxury, you can have it. But if you’re on a budget, you can spend less in a day here, including meals and lodging, than the taxi fare from Gatwick to Victoria Station. At Tonlé Sap, I opted for the small boat, and sat in the open air, close enough to the water for me to cool my fingers in it. The crew consisted of a pilot and a young man who labored to keep me informed, but in an English that only deepened the mystery of life. Over the next couple of hours, I saw things I had never seen in any of my earlier travels. Tonlé Sap is not just a lake, it is a city, or better yet, it is a constellation of villages. They are demarcated by ethnicity and religion, but they all have one thing in common: they are floating. 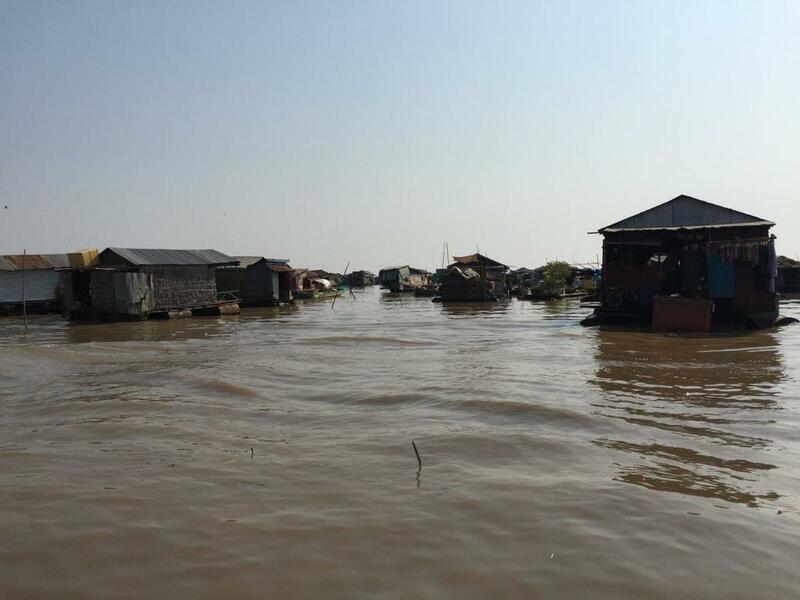 The people of Tonlé Sap live in floating houses, buy their rice in floating stores, seek medical aide in floating clinics, and educate their children in floating schools. The life of this “river” is actually lived on the river, itself, and in a way that, as far as I know, exists nowhere else on earth. About midway during my tour of Tonlé Sap, we stopped at a floating store to buy a few refreshments. While we were there, a boat sidled up. There was a woman and a small child inside it. The boat was a very rickety affair. In fact, it was continually sinking. So much so, that the woman could not actually leave it to shop. Rather, she ordered what she needed while she baled water from the boat’s ruptured hull. Her child, a little girl of around six, sat at the back of the boat, playing with a plastic toy, completely at home in her watery world. There was beauty in her concentration, I thought, and in the pleasure she found in her play, and even in her indifference to the sinking boat that held her. 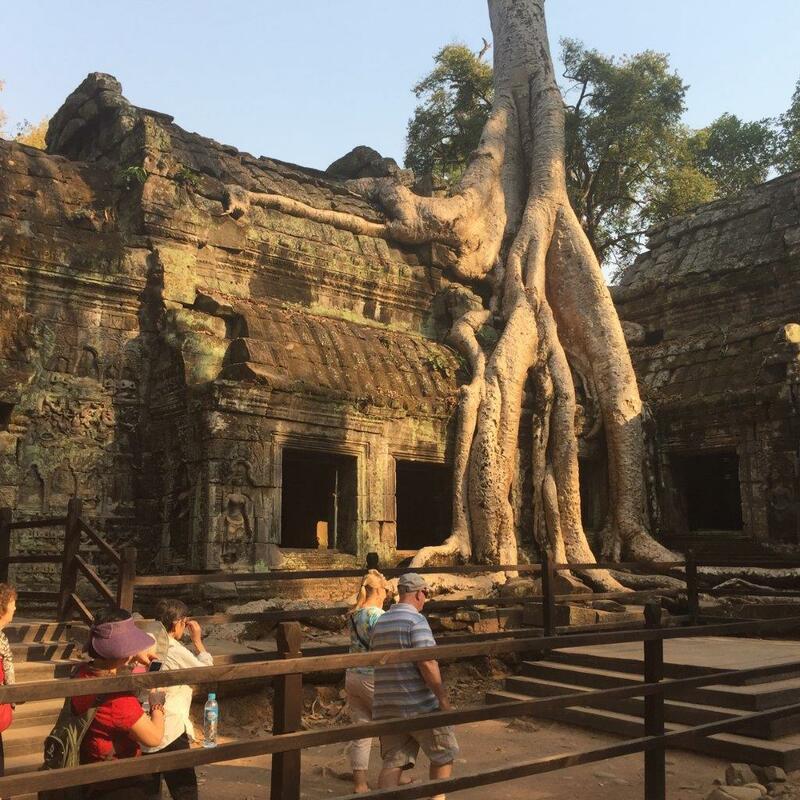 Such an experience could not have been had on Pub Street in Siem Reap or among the fantasy temples of Angkor Wat. Perhaps in all the world, it could only be had on Tonlé Sap.